The phenomenon of Belarusian musical culture represents an extensive stratum of the spiritual life of the Belarusian nation. One of its important components is the training of choral conductors which, at all stages of its development, has been closely connected with choral singing. Choral education originated in the 10th century, in the Middle Ages. At that time, the first singing schools were established within Orthodox churches and monasteries, the most famous of which were the schools of Polotsk, Turov and Vitebsk. We can look upon the time when the Grand Principality of Lithuania was formed on Belarusian territories, before the Renaissance and Baroque epochs (second half of the 16th century to the beginnings of the 17th century), as the “golden age of choral education. The traditions of Western European music and musical education became firmly established here as a result of the union between the Grand Principality of Lithuania and the Polish Kingdom. Church singing was included into “the Seven Liberal Arts”, studied at educational establishments of various religions, and thus, musical education became an inalienable part of forming an individual of high culture. Choral singers – choristers and precentors for serving in churches, and professional musicians, again for the church but also for choirs at royal and noble courts– were trained in Jesuit educational establishments (the Academy of Vilna, colleges, musical seminaries) and Orthodox brethren schools situated in Vilno, Mogilev, Brest, Grodno, Minsk and other cities. The training of choral singers reached a high standard and was conducted systematically on the basis of manuals and methodical guidelines. Each educational establishment had a choir that performed a large repertoire of religious compositions, ranging from monody to polyphony. Singing groups took part in church services and theatrical performances at schools which included panegyrical and ecclesiastical hymns, vocal dialogues and ballet choirs. Major advancements in the sphere of choral education on Belarusian territories are connected with the activity of such prominent musicians as N. Diletskiy and S. Lauxmin, the authors of treatises on music theory “An Idea of Musical Grammar” and “The Theory and Practice of Music”. Another interesting period in the development of choral education was the second half of the 18th century. This era saw the intensive growth of the music culture of the aristocracy, characterized by performances of large-scale works and a great diversity of repertoire. Peasant theatres became widespread. Wealthy patrons of the arts like the Radzivil, the Sapieha and the Zoricz families would order the establishment of opera and ballet groups and various orchestras within their theatres, and would also open theatrical and musical schools which, in contrast to church schools, trained actors and musicians for performing secular music. Such schools were founded in Nesvizh, Grodno, and Slutsk. Their curriculum included choral lessons, instrumental tuition and studies of theory and composition. Students took part in theatrical performances as choristers. The turn from the 19th to the 20th century was marked by active development of choral education. The incorporation of Belarusian territories into the Russian Empire and the beginning of the democratization of public and concert musical activity entailed substantial changes in choral education. Alongside universal singing training, realized in all general and specialized musical educational establishments, the professional training of choral conductors was initiated. The teachers of church singing for “ordinary” schools, grammar schools and other educational establishments, and precentors of amateur and church choirs, were trained at secular colleges (five for teachers at secondary schools, three for future teachers in higher education) and clerical educational establishments (eleven specialized schools, four seminaries), as well as in summer courses for teachers and precentors. 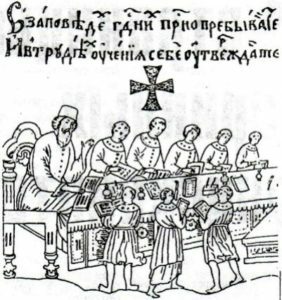 The process of training choir singers and teachers of religious singing was strongly influenced by the popular education reform, aimed at strengthening the religious, moral and patriotic education of youth, as well as by Russian methodological techniques and singing traditions. 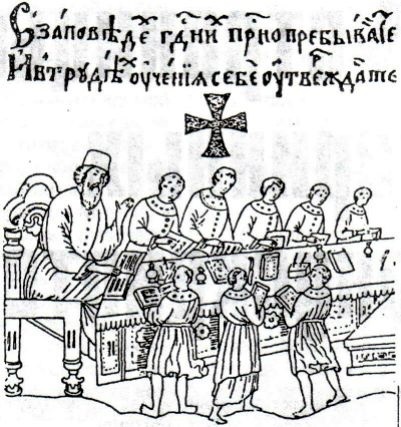 The training of precentors was oriented towards the development of musical abilities and skills that students would need in their future profession, and the formation of an active and conscious attitude to their future vocation: the study of elementary theory of music, harmony and of methods of primary vocal and choral education; the mastery of a certain range of religious chants; oral training for “vocal” purposes, the formation of choral and conducting skills; learning to play musical instruments – all these were integral parts of choral singers’ training. Choral conductors’ education was based on the principle of an inseparable connection with choral practice. Students’ choral singing was represented by varied choral groups: homogeneous – female (in female church-run schools and grammar schools), children’s (in schools run by local parishes and “exemplary” schools – the schools in which student teachers did their teaching practice under supervision, which were thus particularly good and advanced schools), male (at theological seminaries and specialized schools), and mixed – at teachers’ and precentors’ courses. Students’ choirs performed regularly. Important participants in Sunday church services, choirs also engaged in many other types of performing activity, taking part in concerts held to mark anniversaries, patronal feasts, visits of high-ranking personalities and associated school events, and literary and musical evenings. The repertoire of students’ choirs was formed as a direct outcome of performing practice and included religious music, works by Russian and foreign composers, and folk songs. On the basis of choral performing practice, it became possible to single out general principles of the dramatic structure of choral performances (programmes were arranged according to topical, chronological, stylistic or genre subjects) and main criteria for evaluating the level of performing skills. After the triumph of the Great October Socialist Revolution, the establishment of the forms and methods of choral conductors’ education in Belarus became closely connected to the formation of Soviet art as a whole. For the first time ever, the children of workers and peasants got free access to educational establishments, and the state became responsible for managing the educational system. Music schools, technical secondary schools, conservatories were opened in various provinces of Belarus. The process of training choral conductors there was characterized by a combination of teaching, performing and general education. These establishments had their own choral groups whose repertoire included quite difficult 4- to 8-part compositions. A lot of interesting aspects of musical education in Belarus are connected to the activity of such prominent conductors as N. Malko and M. Antsev. Their ideas on the contents of lessons in conducting, on the correlation between performing and pedagogical training in the process of educating choral conductors, had a positive effect on music pedagogics in Belarus. A significant role in the training of national music professionals was played by the State Conservatory (founded in 1932) which has a special department of choral conducting. At different times, the department was headed by famous performers and conductors, among them I. Bari, I. Gitgartz and V. Rovdo. The entire activity of the department was closely linked to Belarusian choral performance and the development of choral amateur activity. Many conservatory students combined lessons with engagement in professional choral groups. This was not only authorized, but even encouraged, because it favored the consolidation of theoretical knowledge through practice. To this end, the students of all years were also expected to conduct the choir of the conservatory. A special feature of the department of choral conducting at the Belarusian State Conservatory was the close connection of choral class activity with other specialized disciplines, among them solfeggio, harmony, choral score-reading, musical and choral literature and piano. Every new period in the social, economic and cultural life of society posed new corresponding challenges, including those in the sphere of musical education. The modern system of choral conductors’ education represents a chain of interacting links: primary – secondary – higher – postgraduate. Primary conductors’ training performs the double function of providing general musical education to the young generation as well as supplying a professional orientation to the most talented children, cultivating primary professional knowledge and skills in them. Educational establishments at this level include music schools for children, choral schools and schools of art. In the Republic, there function a number of specialized schools for gifted children offering a 12-year period of study that encompasses the primary and secondary stages of musical education. Primary education is characterized by different study plans and the creation of advanced systems of assessment. Specialized secondary choral conductors’ education is the stage of professional self-determination of a creative individual; it is also the time for acquiring professional knowledge and skills. In Belarus, the foundations for this level of development are provided by the choral departments of specialized musical schools and colleges that function according to standardized study plans and curricula. Their 10-point grading system is the most precise way to determine the level of students’ competence. Tertiary education (for students continuing their training beyond the age of compulsory schooling) is the period of professional establishment of a person and of the achievement of mastery in the sphere of choral art. This stage of education is provided for by the Academy of Music (up to 1992 the Belarusian State Conservatory), the University of Culture and the Pedagogical University, which are notable for their wide and varied approaches to the contents of studies at choral conducting departments. Among the important features of modern choral conductors’ training are diversification, the retention of traditions and the continuity of the educational process. An integral quality of the process of choral performers’ training is the unity of theory and practice – the choral class being one of the major parts of study activity. Students’ choirs functioning at all educational establishments actively engage in a variety of concerts and other activities that serve to extend their experience. Nowadays, domestic choral conducting education faces the challenge of preserving and developing the national music culture: the artistic works of folklore and the national composing school; performing traditions manifested in a range of methods of transmitting the performer’s message; and vocal choral techniques, established in the Republic. Educational establishments solve this task in a number of ways: examples of folklore and works by Belarusians are included into the repertoire of students’ choirs and into specialization and singing curricula – they are exploited according to the current singing tradition; and students’ groups take part in artistic presentations of the Union of Belarusian Composers. international contests, seminars, scientific and methodological conferences, workshops are put on by of educational establishments. An important aim of all the ramifications of the educational system remains the enhancement of the professional training of choral art experts. An active application of modern computer technologies in class, turning the monologue of lectures into a dialogue, the arrangement of new forms of students’ out-of-class activities, the implementation of role play and problem-oriented methods into the educational process, the involvement of talented young people into scientific research activity, graduates’ internship in amateur and professional choral groups – these are the leading means by which the efficiency of studies is increased. The proficiency level of graduates at all stages is fairly high. Students’ choral groups are frequently to be found as participants and winners of domestic and international choral festivals and contests. Singing groups play a leading role in the organization of choral festivals at local and nationwide level.